The minimum CPU requirements are an i3-4130T 2.90GHz or an AMD FX6300 with i5-6500 3.20GHz being recommended. My main rig has an i5-2500K clocked at 3.3GHz, which meets the minimums quite easily. My laptop, which I am also using for benchmarking as the low-spec system, has an A10-9600p at 2.4GHz which likely falls below the minimum requirements. When it comes to GPU requirements, an R7 270 is placed as the minimum along with the 650 Ti and the Intel Iris Pro 6200 and a 970 is recommended. My main system still uses the R7 370 4G which is close to the 270 in terms of performance, considering it is practically the same chip with slightly higher clock speeds. The laptop uses the APU’s built-in graphics chip which is marked as an R5 (320 stream processors at 720MHz). 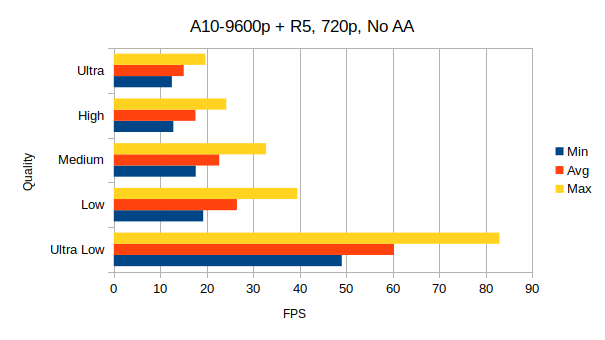 The APU is significantly slower than an R9 270. Both systems have the minimum required amount of RAM (8GB) with the main system using 1333MHz DDR3 memory while the laptop has 1866MHz DDR4. Both systems run Antergos 64-bit with kernel 4.9.11 and Mesa 17.0.0. Now that that’s done, let’s dive deep into the world of numbers and framerates! As you can see, my main gaming system dealt with DiRT Rally quite well. The game remained playable all the way from Ultra Low to Ultra. At Ultra Low the average framerate was a 197 FPS and the game only dropped as low as 143 FPS. At Medium settings the minimum framerate was still at 59 FPS, meaning the framerate was as smooth as it can be all the time when viewed on a 60Hz monitor. 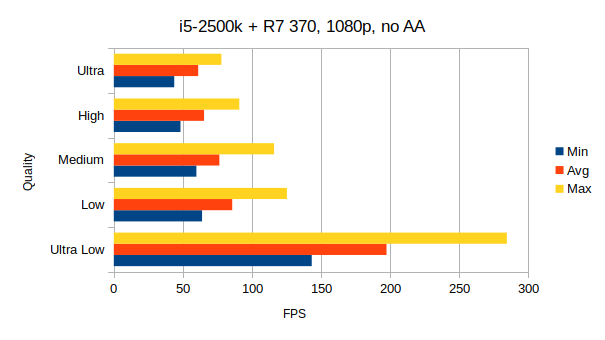 On High and Ultra the minimum framerate dropped to the 40s but averages were still on the healthier side of 60 FPS. On the APU things weren’t going too smoothly anymore. At 1080p only Ultra Low could be considered playable, with the average being at 43 FPS and minimum at 35 FPS. Going anywhere above that resulted in the minimums and averages to drop below 20 FPS. You could probably fiddle with the settings to get a stable-ish 30 FPS with a combination of Ultra Low and Low settings at 1080p. Considering this laptop of mine isn’t really a gaming beast, I’d say this is acceptable performance. Dropping the resolution down to 720p definitely helped the APU pump out some additional frames, but going above Ultra Low still resulted in an experience I would no longer call playable. However, tweaking with the advanced settings should allow for a slightly shinier graphics at 720p than at 1080p. Alternatively you could just stick to Ultra Low and you would get an experience I would call fully playable, with the framerate being between 49 and 83 FPS. Also worth noting is that there were graphical glitches with the A10-9600p when graphics were set to Low or above. The glitches were fairly minor however, the tape fence along the track seemed to blink in and out but nothing else seemed to be affected. I'm not sure what caused this but considering it didn't appear on my R7 370 it's possibly linked to the amdgpu kernel driver, which is what my APU uses. In conclusion, DiRT Rally performs pretty damn well on Linux and I don’t have anything to complain about when it comes to performance. Keep in mind that while I did include my laptop into the testing, I did not expect particularly great results from it to begin with and I’m actually quite happy with how things turned out with the APU. Have you tried out DiRT Rally on your system? Make sure to share your performance numbers in the comments! What is the model of your laptop? A lot of recent AMD mobile APUs were restricted to only 15W setups and tiny batteries, witch didn't help at all to compete with Intel equipped models. On a 2160p monitor scaled down to 1080p, avg 87fps, all ultra except 8xMSAA. 16xMSAA was horrible; 37% drop. Not much has changed since then except I'm on 4.10/378.13 driver. Overall excellent port. Has anyone else noticed the nice resource management?! My laptop hasn't gone over 60C, and this one is definitely multithreaded -- 78 threads ATM, with 3.3GB system/2.0GB GPU memory used for the game. saildata On a 2160p monitor scaled down to 1080p, avg 87fps, all ultra except 8xMSAA. 16xMSAA was horrible; 37% drop. why are you running 1080p on a 2160p monitor ? Is it desktop for 4k and gaming @1080p ? Also MSAA @x2 is usually adequate at 4k, and x4 for 1440p. I found X8 MSAA to actually create a slight edge bluring @ 1080p & 1440p but at least that is better than the awful fxaa / mlaa alternative. Switching CPU governor from ondemand to performance could be very useful for running games on APU. RussianNeuroMancer Switching CPU governor from ondemand to performance could be very useful for running games on APU. @meggerman I noticed over 55% frame count reduction with no visual improvement; so all loss no gain. Oh, and yes the rest of the system is Gnome shell at 2160p. @RussianNeuroMancer modern chips don't really see much benefit from governor changes, I usually stick with p-state for thermal sanity but totally agree that there could be some upside to performance. I also wanted to test disabling the new default Nvidia threads config, that's one that can sometimes be huge gains or losses depending on the code. Usually it's gains but with these ports you never know what the secret sauce will be. Overall, I'm a happy camper at over 80fps.. refresh is 60 so it's all bonus at this point. 1080p, Manually everything maxed out except AA which is on 4x - runs 95-115fps. i've a laptop with an APU A10 8700p (very similar to the A10 9600p). my APU has 15W tdp (the version with 35TDP, is a lot more powerful), how many TDP has the 9600p that you have tested? have you tested with DDR3 or DDR4??? what is the frequency of the ram? 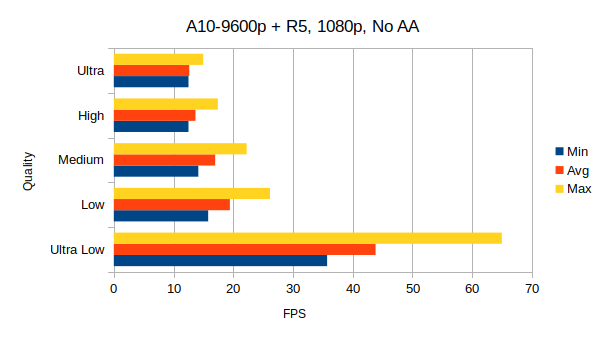 for the integrated APU's GPU, the ram frequency is really important for performance. there is a message that says unsupported hardware, but it's playable enough with mesa-glthread coming it should get better. I'm running ck kernel 4.9, with cpu governor set to performance.